Jeff Bezos Buys the Washington Post: The New Philanthropy, or Power and the Press in the New Gilded Age? Jeff Bezos, the CEO and controlling share-holder of internet giant Amazon bought the newspaper last weekend that broke the Watergate story, published the Pentagon Papers (along with the New York Times) and, in June of this year, helped to break the story on the NSA’s mass surveillance practices: the Washington Post. He paid $250 million for it, 1/100th of his net worth ($25.2 billion) in 2012. Most commentators appear hopeful that Bezos will use his enormous personal wealth — he is the 12th richest person in America and 19th in the world — and business acumen to turn the floundering Washington Post around and chart a renaissance for the beleagured press in the United States more generally. Most seem to think that he will operate the paper in a way that is consistent with the traditions and requirements of a free press. “I understand the critical role the Post plays in Washington, DC and our nation, and the Post’s values will not change . . . . Our duty to readers will continue to be the heart of the Post, and I am very optimistic about the future. ”Jeff Bezos’ proven technology and business genius, his long-term approach and his personal decency make him a uniquely good new owner for the Post”. Bezos also undoubtedly won favour in the executive suite by agreeing to bring several senior executives at the Post with him to the new company he will set up independently of Amazon: Katharine Weymouth, the current CEO and Publisher of The Washington Post (and heir to the Graham family that currently holds the dominant stake in the paper’s parent company, and niece to family patrician Donald Graham); Stephen Hills, President and General Manager; Martin Baron, Executive Editor; and Fred Hiatt, Editor of the Editorial Page, will all retain their jobs. For how long, however, he did not say. His pledge to the newspaper’s 650 journalists that there would be no lay-offs for a year also no doubt helped to allay whatever concerns might have arisen among journalists. This is Bezos as the 21st century version of the Carnegies, Rockefellers and Fords. Whereas they built libraries, foundations and schools, he is revitalizing a landmark press institution in the U.S., the Washington Post, and, if all goes well, lighting at least part of the path to recovery for the rest of the newspaper business. The Washington Post is in financial trouble. Revenues for the newspaper segment at it’s parent company, the Washington Post Company, peaked at $961.9 million in 2006. By last year, they had plunged to $581.7 million. The division has not turned a profit since 2008, either (Washington Post Company’s Annual Reports). Declining advertising revenue has led the way; paid weekday circulation has declined sharply from 768,000 copies in 2002 to around 450,000 today (Steve Ladurantaye; Annual Report 2012, p. 21). Online revenues have grown greatly, but from a low base and are nowhere near covering the losses. The paper’s role within the overall Washington Post Company has shrivelled as well. Whereas it accounted for a quarter of total revenues in 2006, by last year it accounted for just 14%. The education division (55%), cable television (20%) and other activities (10%) accounted for the rest. The company as a whole continues to be profitable, however, and even during the financial crisis years of 2008 and 2009, it turned profits between 5-6%. Profit levels have been in the 10-15% range for most of the years before and after that, but last year they fell to under 4% — half the rate of the year before (Annual Report 2012, p. 1). They are down further yet this year, with newspapers and broadcast television the biggest drags on the company’s balance sheet (Ladurantaye). Of course, the woes of the Washington Post reflect the woes of the US newspaper industry in general. The U.S. and UK press have suffered the most amidst the ‘crisis of journalism’ afflicting much of the Euro-American world. A 2010 study by the OECD indicated that the woes of the press set in earlier in the US and UK than in most countries, 2005-2006, and have been unrelenting since. The growth of internet advertising relative to other media also started earlier and tends to account for a bigger share of all advertising spending in both countries as well (see Ofcom, International Communication Market Report, p. 187). 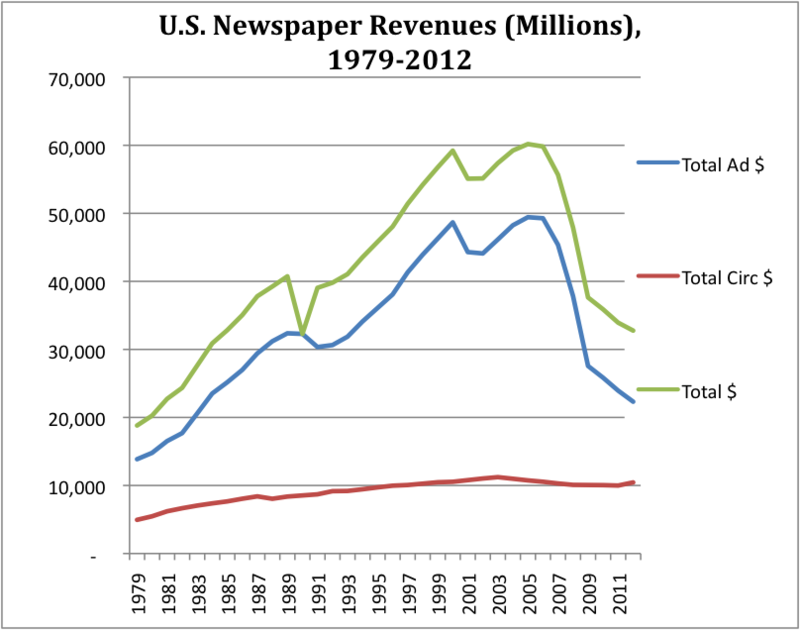 U.S. newspaper industry revenues peaked in 2005 at $61.2 billion. Last year they were $32.8 billion — a fall of almost half (46%), according to the Pew Research Centre’s Project for Excellence in Journalism. Figure One below shows the trend. 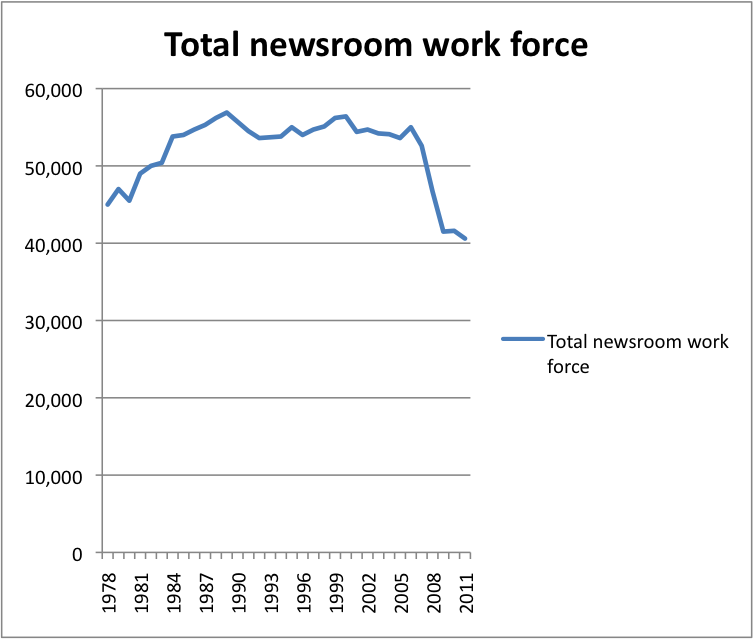 The toll on the number of working journalists has also been grim. Figure 2 shows the trends. While there is no doubt, then, that both the Washington Post and the U.S. press in general are in dire straights, the idea that Amazon CEO is the white knight he is being made out to be is questionable for at least three reasons. Bezos purchase of the Washington Post puts him amidst the swelling ranks of uber-rich individuals who have stepped in to scoop up newspapers that have fallen on hard times. Just days earlier, hedge fund operator and owner of the Boston Red Sox, John H. Henry, acquired the Boston Globe from the New York Times. This revival of the new breed of billionaire newspaper owners also includes real estate tycoon Sam Zell, who scooped up the LA Times and Chicago Tribune in 2007, only to drive them further into the ground (see here). It also includes partisan zealots like the Koch brothers, David and Charles (tied for sixth on the Forbes’ list of billionaires worldwide with a network of $34 billion each), who are circling newspapers in distress in the hope of taking them over and harnessing them to their right wing conservative causes. The hopeful, however, appear to divide the new breed of press mogul into “bad” and “good” capitalists, with Bezos apparently firmly in the latter camp. Like Warren Buffet, the folksy investment guru of Omaha, who acquired Media General’s 63 dailies and weeklies (except for The Tampa Tribune and its weeklies) and several other papers last year, Bezos occupies such a place because he says he values the role of daily newspapers in the communities they serve and because he has supported some progressive causes, notably gay marriage, and operated Amazon as an open bazaar when it comes to books and literature, while refusing to buckle to censorious moralists. According to Eli Noam, in Media Ownership and Concentration in America, the number of owner-controlled media firms fell from 35 percent to just 20 percent between 1984 and 2005 (p. 6). The revival of the press baron in the past few years reverses this trend of the last half of the 20th century when media moguls were steadily being replaced by share-holder owned, managerially-controlled corporate media. The problem with moguls, however, is that the drive for profits are often tempered by the personal quest of newspaper owners for political influence and power. This clouds the independence of the press and turns journalism into the plaything of the rich and powerful. Like other internet giants, Amazon’s annual lobbying budget has risen steeply in the past few years. In 2008, for instance, its lobbying budget was $1.8 million; in 2012, it was $2.5 million. It also doubled the number of lobbyists from 12 to 25 over the same period. While still modest compared to Google ($16.5 million in 2012) or Microsoft ($8.1 million), the fact that Amazon’s lobbying budget is high relative to other companies, and that it has risen steeply in recent years, suggests that its appetite for influence over politics, policy and public opinion is growing. Bezos acquisition of the Washington Post could add to that mission. There is a fundamental difference between the press barons of the 21st century and those of the past, however. Unlike the Pulitzers, Hearst, Browns, McCormicks and so forth who made their fortunes in the newspaper business, Bezos, Buffett, Zell and Henry have made their’s from the internet, finance and real estate, as Dean Starkman and Ryan Chittum have observed. The press is being sucked into the orbit of far larger enterprises as a result. The Washington Post case exemplifies the point given that not only is Bezos’ net worth a hundred times greater than the price he paid for the paper, Amazon’s revenues in 2012 — $61.1 billion — were nearly double those of the entire U.S. newspaper industry ($32.8 billion). Newspapers, in other words, are no longer stand-alone operations. They are minor appendages in much larger business empires. The possibility that the component parts of these entities may not always be aligned raises the question as to how journalists will be treated when conflicts of interest arise. The Washington Post could benefit mightily from such arrangements if it is able to use Amazon’s hyper-efficient distribution infrastructure as a way to cut the enormous cost of delivering the paper to readers down to size. However, this could also be another case where “content” is sublimated to technology and distribution, a mere tool used to promote the acquisition and use of technology, similar to how ‘free radio programs’ served such a purpose for the manufacturers of radio transmission and receiving equipment in the early days of radio history. As John Cassidy asks, is the Washington Post‘s new role primarily to prime the pump for the sale of more Amazon Kindle e-readers? Amazon’s clout in online book retailing illustrate the point even better. In this domain, Amazon’s ability to effectively set prices and rule the book publishing industry with an iron fist has put it at war with publishers. This is not hyperbole, but the conclusion recently reached by Judge Denise Cote in a decision that found Apple guilty of colluding with the ‘big five’ book publishing giants in the U.S. — Harper Collins (NewsCorp), Simon & Schuster (Viacom), Hachette, MacMillan and Penguin — to form a scheme intended to break Amazon’s stranglehold in online book retailing. Indeed, the book publishers’ “abhorence of Amazon’s pricing” drove them to join forces (collude) with Apple to devise a plan that would “eliminate retail price competition”, raise prices, hold back books for online distribution, and establish a whole new business model. All of this was to be accomplished in an astonishingly short period of time — 4 months — to coincide with when Apple “launched the iPad on January 27, 2010” (p. 10). Apple wanted a secure line of content from top publishers to help drive uptake of its new devise, the publishers wanted to regain control over their industry from Amazon (pp. 10-13). A win-win for them, but a loss for Amazon and consumers / readers because of higher book prices and the triumph of collusive behaviour over competitive market forces. Underneath it all, however, lays the idea that technology and capital are in charge, not content or even Bezos for that matter. Those who hold out Bezos as a saviour ignore all of this. Lastly, while many commentators point to Bezos’ liberal stance when it comes to gay marriage and his track-record of standing down pressure to censor books as a good sign for the values of the free press, it is essential to remember the entirely different stance Amazon took towards the whistle-blowing site Wikileaks. In this case, Amazon’s web hosting service, AWS, far from standing up for the free press, banished Wikileaks’ content that had been stored on its servers. It did so the same day (December 1, 2010) it received a letter from Senator and Senate Committee on Homeland Security and Governmental Affairs Chair, Joe Lieberman (2010) calling on any “company or organization that is hosting Wikileaks to immediately terminate its relationship with them”. That Amazon so dutifully and quickly did so raises questions about Bezos’ self-professed commitment to free press values (Benkler, 2011). Given that dubious track record, we can also wonder about how supportive Bezos would have been in relation to the Washington Post’s ground-breaking coverage of NSA contractor Edward Snowden’s leaking of documents detailing the agency’s secret program of mass surveillance and metadata collection, worldwide and in the United States, over the past few months? (see here, here and here, for example). In the face of intense pressure from the U.S. government, would Bezos have stood firmly behind Washington Post journalists or buckled as in the past to protect the vastly larger interests of the company he created, leads and still controls?